How to verify captured objects on Web pages? I want make sure those objects are captured correctly. You can follow this tutorial to verify captured objects on Web pages. 1. Open the Web page in the Google Chrome browser. 2. 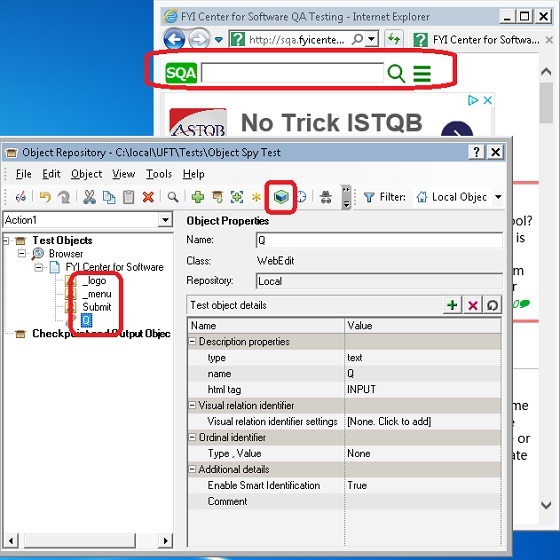 Open the local object repository of Action 1 in UFT. 3. Locate an object in the Test Objects tree. 4. Click the "Object" icon, UFT will highlight the matched object on the page. 5. Repeat this process for all objects on all Web pages.